Hamburg, Germany, November 24 – 27, 2018. The 2018 Congress has the aim to bring together participants active in all fields of basic and clinical research in Oncology, in order to optimize clinical results in cancer prevention, diagnosis and therapy. More than before, Biomarkers hold out promise for improving the outcome of cancer patients by optimization of diagnostic procedures in combination with clinical parameters and various imaging methods. By continuous development of standardization, quality contol and automatization, as well as by applying new individualized targeted treatments, we succeed now to improve patients state and survival.The new therapeutic agents can be combined with the established chemo-radiotherapy of Cancer disease. Relevant new findings in research, diagnosis and clinical Oncology - as well as technical developments, standardization and quality control, will be presented by opinion leaders in Oral and Poster presentations, along with panel discussions and special topic seminars. A wide range of companies and commercial exhibitors will show their products and services, enabling a valuable exchange between different suppliers and users, colleagues, as well as members of the technical staff. In addition, as during recent years, the EGTM (European Group of Tumor Markers) will present their Guidelines on optimal use of Tumor Markers and their clinical interpretation. Hamburg is a beautiful metropolis in the northern part of Europe and Germany, well-known for sightseeing in the centre with the Alster and the Elbe and for social events, shopping, dining, museums of art and science/ history. In addition, the congress time in November will also allow the participants to enjoy the first days of the well-known Christmas Markets in the city of Hamburg. Please allow us to look forward to host you at the ISOBM Congress in Hamburg, November 2018, to exchange ideas and expertise in an International forum and to enjoy the hospitality of Hamburg. 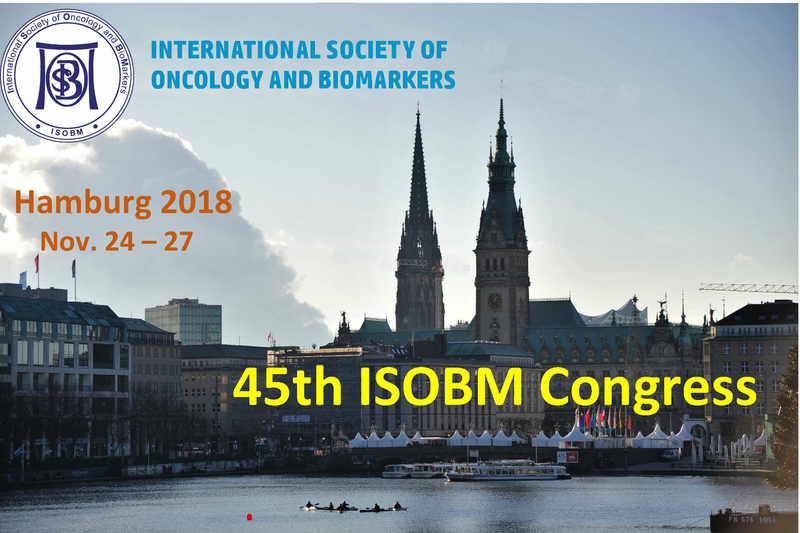 I would like to express my great pleasure that the ISOBM decided to organize their 45th ISOBM Congress at Hamburg this year. In addition, on behalf of the Hamburg Symposia on Tumor Markers I would like to invite all participants of the previous Hamburg Symposia to actively contribute to a successfull and constructive ISOBM congress. I wish us an exciting and inspiring congress and each and every one of you a pleasant stay here in Hamburg in November.